At Republic West Remodeling, we’re deeply proud of the more than 17,000 Phoenix home remodeling projects we’ve completed since 1995 – kitchen and bath remodels, whole house remodels, partial home renovations, and more. These are all projects that added sophistication, style, value, and function to our clients’ homes. Above all, we’re proud of our loyal customer base. More than half of our home remodeling projects each year are performed for past clients or for people who have been referred by them – a remarkable achievement in an industry notorious for referral rates in the single digits. The Dream Assurance Plan is built on a vision – an idea. The team of home remodelers at Republic West Remodeling has developed, through their years of experience and a passion for excellence, an exclusive home remodeling process that strives to deliver a pleasant experience and a successful outcome for their customers. Many homeowners have come to expect the nightmare remodeling project that is so prevalent in today’s market place. We would like to change that. With Republic West Remodeling, you can rest assured that your Phoenix home remodeling project will be a dream come true throughout the entire process – from creative design to detailed planning to execution and construction. Projects Completed with Care and Respect. 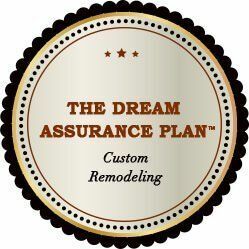 We Are the Home of The Dream Assurance Plan™. Contact us today for the highest quality luxury home remodeling services. We proudly serve Scottsdale, Phoenix and the Phoenix Metro area. Call (480) 478-8700 for your free consultation or contact us online.